UDP-glucuronosyltransferases (UGTs) have been implicated as important detoxifying enzymes for several major tobacco carcinogens. Because the aerodigestive tract is a primary target for exposure to tobacco smoke carcinogens, the major goal of the present study was to determine whether aerodigestive tract tissues exhibit glucuronidating activity against metabolites of benzo[a]pyrene (BaP) and to explore the pattern of expression of UGT genes in a series of aerodigestive tract tissue specimens. Glucuronidation of the phenolic BaP metabolites 3-, 7-, and 9-hydroxy-BaP was observed in all upper aerodigestive tract tissue microsome specimens tested, as determined by high-pressure liquid chromatography analysis. Glucuronidating activity toward the procarcinogenic BaP metabolitetrans-BaP-7,8-dihydrodiol(±) was also detected in aerodigestive tract tissues. By semiquantitative duplex reverse transcription-polymerase chain reaction analysis, UGT1A7 and UGT1A10 were shown to be well expressed in all aerodigestive tract tissues examined, including tongue, tonsil, floor of mouth, larynx, and esophagus. UGT1A8 and UGT1A6 were expressed primarily in larynx; no expression was observed for UGTs 1A1, 1A3, 1A4, 1A5, 1A9. Of the family 2B UGTs, only UGT2B4 and UGT2B17 exhibited significant levels of expression in aerodigestive tract tissues. Of the aerodigestive tract-expressing UGTs, only UGTs 1A7, 1A8, and 1A10 exhibited glucuronidating activity against 7-hydroxy-BaP, with UGT1A10 exhibiting the highest affinity as determined by kinetic analysis (Km = 49 μM). No UGT expression or glucuronidating activity was observed for any of the lung specimens analyzed in this study. These results suggest that several family 1 UGTs may potentially play an important role in BaP detoxification in the aerodigestive tract. The UGT2 superfamily of enzymes catalyze the glucuronidation of a variety of compounds, including endogenous compounds like bilirubin and steroid hormones, as well as xenobiotics including drugs and environmental carcinogens (Tephly and Burchell, 1990; Gueraud and Paris, 1998; Ren et al., 2000). Based upon differences in sequence homology and substrate specificity, two main families of UGTs (UGT1A and UGT2B) have been identified in several species, each containing several highly homologous UGT genes. The entire UGT1 family is derived from a single loci in chromosome 2, coding for nine functional proteins that differ only in their amino terminus due to alternate splicing of the independent exon 1 regions to a shared carboxy terminus encoded by exons 2 to 5 (Owens and Ritter, 1995). In contrast to the UGT1A family, the UGT2B family is composed of several independent genes, all located on chromosome 4 (Jin et al., 1993a,b; Beaulieu et al., 1997, 1998; Belanger et al., 1998; Carrier et al., 2000). In previous studies, several UGTs, including UGT2B7, UGT1A9, UGT1A7, UGT1A8, and UGT1A10, were implicated in the conjugation and detoxification of metabolites of several tobacco carcinogens, including tobacco-specific nitrosamines like NNK (Ren et al., 2000), and polycyclic aromatic hydrocarbons, such as BaP (Jin et al., 1993a,b;Grove et al., 1997; Mojarrabi and Mackenzie, 1998; Strassburg et al., 1999; Guillemette et al., 2000). In addition, several studies have demonstrated that UGTs exhibit a protective effect against these carcinogens. The addition of UDPGA to the Ames test is associated with a reduction in BaP mutagenicity (Nemoto et al., 1978; Owens et al., 1979). In studies of UGT-deficient homozygous (j/j) and heterozygous (j/+) RHA rats versus UGT-normal (+/+) RHA controls, reduced glucuronidation of BaP metabolites in vivo was correlated with increased covalent binding to hepatic DNA and microsomal protein (Hu and Wells, 1992). In addition, a similar correlation was observed after in vitro incubations of BaP with rat liver microsomes, lymphocytes, or skin fibroblasts from UGT-deficient RHA rats (Hu and Wells, 1992; 1994;Vienneau et al., 1995). Therefore, several UGT enzymes could potentially play an important role in the detoxification of tobacco carcinogens. Although studies examining UGT expression patterns in human tissues have been performed extensively for metabolizing organs and tissues of the digestive tract (Strassburg et al., 1998a,b, 1999, 2000), few studies have been performed for tobacco-related target tissues. For tissues of the aerodigestive tract and respiratory system, UGT1A7 was shown to be well expressed in orolaryngeal specimens (Zheng et al., 2001), and UGT1A6 was shown to be expressed in pharyngeal tissue (Ullrich et al., 1997). Family 2B UGTs were reported to be expressed in lung (Levesque et al., 1997, 1999; Hum et al., 1999), whereas several UGTs (UGT1A7, UGT1A8, UGT1A9, UGT1A10, UGT2B7, UGT2B10, and UGT2B15) were reported to be expressed in esophagus (Strassburg et al., 1999). No data have as yet been reported demonstrating glucuronidating activity in such target organ sites. To better assess the role of glucuronidation as a detoxification mechanism in tissues of the aerodigestive tract, the goal of the present study was to determine whether aerodigestive tract tissues exhibit glucuronidating activity to BaP metabolites and to examine the pattern of expression of UGT genes in aerodigestive tract tissues. For expression analysis, total RNA purified from normal human liver (19 samples), lung (32 samples), esophagus (10 samples), larynx (three samples), tongue (five samples), tonsil (three samples), and floor of mouth (three samples) specimens was obtained from the Tissue Procurement Facility at the H. Lee Moffitt Cancer Center. All RNA samples were purified from tissue specimens obtained from individual subjects undergoing cancer surgery. Accurate information on recent exposures (i.e., smoking and alcohol consumption) was not available for this study. For glucuronidation activity assays, larynx (n = 4), floor of mouth (n = 2), tongue (n = 2), esophagus (n = 3), tonsil (two specimens from the same patient), and lung (n = 3) specimens were obtained from individual patients via the H. Lee Moffitt Cancer Center Tissue Procurement Facility. Because of the low quantities of normal orolaryngeal tissues obtained during cancer surgery, equal amounts of each specimen from each orolaryngeal site were pooled for the preparation of microsomes. Because larger specimens were obtained for lung, analysis of glucuronidation activity was performed separately in three independent lung specimens. Microsomes were prepared for all specimens by differential centrifugation, as previously described (Coughtrie et al., 1987). All protocols involving the analysis of tissue specimens were approved by the institutional review board at the University of South Florida and were in accordance with assurances filed with and approved by the U.S. Department of Health and Human Services. Assurances were given by the Tissue Procurement Facility at the H. Lee Moffitt Cancer Center that all samples were isolated and quick-frozen at −70°C within 2 h postsurgery. Analysis of Glucuronidating Activity in Tissue Microsomes. 3-OH-BaP, 7-OH-BaP, 9-OH-BaP, andtrans-BaP-7,8-dihydrodiol(±) were obtained from the National Cancer Institute Chemical Carcinogen Repository (synthesized and characterized at the Midwest Research Institute, Kansas City, MO). BaP metabolites were dissolved in dimethyl sulfoxide and stored protected from light at −70°C. UDPGA,dl-2-lysophosphatidyl choline palmitoyl (C16:0), and β-glucuronidase were purchased from Sigma Chemical Co. (St. Louis, MO), and [14C]UDPGA (specific activity, 380 Ci/mmol) was obtained from PerkinElmer Life Sciences (Boston, MA). Orolaryngeal microsome preparations were stored in individual aliquots at −70°C, with protein concentrations determined using the bicinchoninic acid assay (Pierce Corp., Rockford, IL). Microsomes (0.1–1 mg) were incubated with 1 mM 3-, 7-, or 9-OH-BaP, or 2 mM trans-BaP-7,8-dihydrodiol(±), 4 mM UDPGA, 1 μCi [14C]UDPGA (where indicated), 10 mM MgCl2, 50 mM Tris-HCl, pH 7.4, with or without (as indicated) dl-2-lysophosphatidyl choline palmitoyl (C16:0) (10 μg/100 μg of microsomal protein) for 2 h at 37°C. All reactions were initiated by the addition of UDPGA. Reactions were terminated by the addition of an equal volume of acetonitrile. Precipitates were removed by centrifugation (5 min, 10,000g), and supernatants were filtered and analyzed for glucuronidated BaP metabolites by HPLC using a Beckman HPLC “Gold” System (Fullerton, CA) consisting of a model 110B programmable solvent module, a model 166 UV detector operated at 254 nm, a Waters automatic injector (model 717 plus) (Milford, MA), and a β-RAM radioisotope detector (IN/US, Tampa, FL) equipped with a 1-ml liquid flow cell. The samples were injected onto a 201TP (4.6 × 250 mm) 5-μm C18 300 Å column (VYDAC, Hesperia, CA). Separations were performed using the following linear gradient conditions: 0 to 5 min, 20% solvent A; 5 to 25 min, 20 to 40% A; 25 to 30 min, 40 to 60% A; 30 to 35 min, 60 to 90% A, where solvent A was acetonitrile and was diluted at the given percentages in solvent B (20 mM NaH2PO4, pH 4.6). The HPLC flow rate was 1 ml/min, whereas the scintillation fluid flow rate was 4 ml/min. The column was routinely washed with 100% A for 15 min and equilibrated after every HPLC run with 20% A for at least 20 min. Glucuronidated conjugates of BaP metabolites were verified by sensitivity of individual reactions to Escherichia coliβ-glucuronidase treatment (1000 units, 37°C, 16 h) using HPLC, as described above. Glucuronidation activities were calculated based on radioflow detection and quantification of disintegrations per minute within glucuronidated BaP metabolite-specific HPLC peaks, as determined using the IN/US radioactivity detection program. Analysis of Glucuronidating Activity of UGT-Overexpressing Cell Lines, Microsomes, or Baculosomes. HK293 (human embryonic kidney fibroblast) cells and HK293 cell lines overexpressing UGT1A8 were kindly provided by Dr. Thomas Tephly (University of Iowa, Iowa City, IA; Cheng et al., 1998), whereas V79 (Chinese hamster fibroblast) cells and V79 cells overexpressing UGT1A6 were kindly provided by Dr. Brian Burchell (University of Dundee, Scotland, UK; Ebner and Burchell, 1993). The stable transfectant of the UGT2B4-overexpressing cell line has been described previously (Ren et al., 2000). UGT2B17-overexpressing cell microsomes were kindly supplied by Chantal Guillemette (University of Laval, Quebec City, Canada). All V79 and HK293 cell lines were grown to 80% confluence in Dulbecco's modified Eagle's medium supplemented with 4.5 mM glucose, 10 mM HEPES, 10% fetal bovine serum, 100 U/ml penicillin, and 100 μg/ml streptomycin and maintained in 700 μg/ml geneticin for selection of UGT over-expression, in a humidified incubator under an atmosphere of 5% CO2. Cells were suspended in Tris-buffered saline (25 mM Tris base, 138 mM NaCl, and 2.7 mM KCl, pH 7.4) and subjected to 3 rounds of freeze-thaw before gentle homogenization. Cell homogenates (5–30 mg of homogenate protein/ml) were stored at −70°C in 100-μl aliquots. Total cell homogenate protein concentrations were determined using the bicinchoninic acid assay, as described above. The rate of 7-OH-BaP glucuronidation was determined for individual UGT enzymes as described above for tissue microsomes in assays without detergent using 0.1 to 5 mg of UGT-overexpressing cell homogenate, 20 μg of UGT-overexpressing microsomal protein, or 0.1 mg of UGT-overexpressing baculosome protein. Initial activity screenings were performed at 37°C for 16 h. Kinetic analysis for all UGTs exhibiting significant glucuronidating activity against 7-OH-BaP was performed as described above using an incubation time of 2 h (where the rate of BaP-7-O-glucuronide formation was still linear for each UGT enzyme tested; results not shown). TheKm andVmax for the glucuronidation of 7-OH-BaP by individual UGT enzymes were calculated after linear regression analysis of Lineweaver-Burk plots. For UGT-overexpressing cell homogenate or microsome experiments, the parent HK293 or V79 cell lines served as negative controls for all in vitro glucuronidation reactions. To confirm that all UGT-overexpressing cell homogenates, microsomes, and baculosomes tested in this study were active, glucuronidation assays were performed with known test substrates. Thin layer chromatography analysis was performed as described previously (Ren et al., 1999, 2000) for glucuronidation assays using 2 mM either 1-naphthol (UGT1A6), clofibric acid (UGT2B4), or androsterone (UGT2B17) as a test substrate. As with 7-OH-BaP glucuronidation analysis, glucuronide formation for these test substrates was confirmed by treatment with E. coli β-glucuronidase, as described above. RT was performed in 20-μl volumes using 3 μg of total RNA, 200 units Superscript II reverse transcriptase (Invitrogen, Carlsbad, CA), and 0.5 μg of oligo (dT)16primer, as outlined in the manufacturer's protocol. Equal amounts of total RNA from each specimen was used for the analysis of pooled RNA samples. For PCR (a 50-μl final volume), each reaction was performed using 5 μl of RT reaction, 0.2 mM dNTPs, 5 U Taq DNA polymerase (Boehringer Mannheim, Indianapolis, IN), 2.5 mM MgCl2, 1× PCR buffer (Boehringer Mannheim), and 20 pmol of sense and antisense UGT-specific primers (see Table1 for primer sequences). To assure that all RT-PCR amplifications were from expressed UGT mRNA, sense and antisense primers were specific for exon 1 and exon 3, respectively, for all UGTs examined except UGT2B15 and UGT2B17, for which the antisense primer was specific for exon 2 sequences. Although the genomic sequence and gene structure of UGT2B4 is not yet known, the antisense primer sequence designed for duplex RT-PCR of UGT2B4 transcripts was homologous to sequences similar to that encoded by exon 3 for other UGT2B family enzymes. Since all family 1 UGTs share exons 2 to 5, the same exon 3 antisense primer was used for expression analysis of all family 1A UGT genes. For the initial screening for the expression of individual UGTs in different tissues, PCRs were incubated at 94°C for 3 min, for 41 cycles of 94°C, 57°C for all UGTs except 61°C for UGT1A1, and 72°C, each for 30 s, using the GeneAMP PCR System 9700 (Applied Biosystems, Foster City, CA). For duplex RT-PCR, human β-actin sense and antisense primers (20 pmol each) were added to PCRs after the ninth cycle. For semiquantitative RT-PCR analysis, aliquots were removed from RT-PCR amplifications after 32, 35, 38, and 41 cycles of PCR. Appropriate positive and negative controls were performed during all RT-PCR analysis, with each PCR performed in duplicate experiments. Polyacrylamide gel (8%) electrophoresis was performed for each RT-PCR (10-μl aliquots), and analysis and quantitation of ethidium bromide-stained RT-PCR products were performed using a computerized photoimager system (AlphaImager 2000; Alpha Innotech Corp., San Leandro, CA). Representative purified RT-PCR products were directly sequenced (Molecular Core Facility, H. Lee Moffitt Cancer Center) after electrophoresis in 1.5% agarose (Wizard Purification System; Promega Corp., Madison, WI) to confirm the UGT sequence of RT-PCR products. Glucuronidating Activity of Aerodigestive Tract Microsomes toward BaP Metabolites. As a marker to evaluate whether aerodigestive tract tissues exhibit glucuronidating activity against metabolites of BaP, studies were initially performed using 7-OH-BaP as substrate. As shown in Fig.1, significant levels of BaP-7-O-Gluc was detected in glucuronidation assays using pooled samples of human esophageal microsomes. 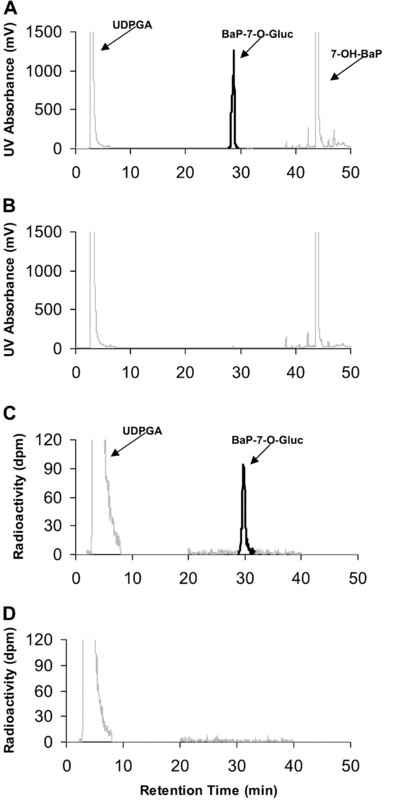 BaP-7-O-Gluc formation in esophageal microsomes was detected by both UV detection (254 nm; Fig. 1A) and UDPGA-derived [14C]glucuronic acid incorporation (Fig. 1C), and the predicted BaP-7-O-Gluc peak on HPLC was sensitive to treatment with β-glucuronidase (Fig. 1, B and D). The rate of glucuronidation of 7-OH-BaP for esophageal microsomes (16.4 nmol · mg of protein−1 · 120 min−1; Table 2) was similar to that observed for liver microsomes (21.2 nmol · mg of protein−1 · 120 min−1; results not shown). High levels of BaP-7-O-Gluc were formed in assays of pooled microsomes (0.1 mg) from all other aerodigestive tract tissues tested, including larynx, tonsil, tongue, and floor of mouth (Table 2). No difference in activities were observed for any tissue microsomes in assays with or without dl-2-lysophosphatidyl choline palmitoyl (C16:0). No activity was observed in human lung microsomes using as much as 1 mg of microsomal protein in assays with or withoutdl-2-lysophosphatidyl choline palmitoyl (C16:0). HPLC analysis of BaP-7-O-Gluc formation by human esophageal microsomes. Microsomes (100 μg of protein) from pooled human esophageal specimens (n = 3) were incubated for 2 h at 37°C with 1 mM 7-OH-BaP and 4 mM [14C]UDPGA (1 μCi), as described under Materials and Methods. A, BaP-7-O-Gluc formation as shown by UV detection (254 nm); B, BaP-7-O-Gluc formation as shown by UV detection (254 nm) in assays including β-glucuronidase, as described underMaterials and Methods; C, BaP-7-O-14C-Gluc formation as shown by radioactive detection; D, BaP-7-O-14C-Gluc formation as shown by radioactive detection in assays including β-glucuronidase, as described under Materials and Methods. Similar to that observed for 7-OH-BaP, high levels of glucuronidating activity were observed against both 3-OH-BaP and 9-OH-BaP with all aerodigestive tract tissues tested (Table 2). All aerodigestive tract tissue microsomes except larynx exhibited activity in the order of 7-OH-BaP > 3-OH-BaP > 9-OH-BaP. Significant levels of glucuronidating activity were also detected against trans-BaP-7,8-dihydrodiol (±) for pooled microsomes (1 mg of protein) from both laryngeal and esophageal tissues (Table 2). No glucuronidating activity was detected againsttrans-BaP-7,8-dihydrodiol (±) in tonsil microsomes using up to 1 mg of microsomal protein. Glucuronidation oftrans-BaP-7,8-dihydrodiol (±) was also not detected in pooled microsomes from both tongue and floor of mouth, but assays were performed using only 0.1 mg of microsomal protein for these tissues due to the relatively small amount of specimen obtained for each of these sites. Similar to that observed for 7-OH-BaP, no activity was detected against 3-OH-BaP, 9-OH-BaP, or trans-BaP-7,8-dihydrodiol (±) in assays of human lung microsomes using up to 1 mg of microsomal protein (Table 2). To evaluate UGT gene expression in aerodigestive tract tissues, duplex RT-PCR analysis was performed for pooled total RNA samples prepared from multiple normal human tongue, tonsil, floor of mouth, larynx, and esophagus, as well as from normal human lung and liver specimens. Of the family 1 UGTs (Fig. 2A), UGT1A6, UGT1A7, and UGT1A10 were all expressed in aerodigestive tissues but not in lung. Similar to that observed by Strassburg et al. (1999), UGT1A7, UGT1A8, and UGT1A10 were not expressed in human liver. UGT1A8 was detected specifically in larynx but not in other aerodigestive tract tissues or in lung. Although significant levels of expression was observed in liver, no expression of UGT1A1, UGT1A3, UGT1A4, or UGT1A9 was detected in lung or in any of the aerodigestive tissues examined using pooled RNA samples (Fig. 2A) or RNA from individual specimens (results not shown). Similar to that described previously, UGT1A5 mRNA was not detected by duplex RT-PCR in any of the tissues examined in this study (results not shown). No differences in UGT expression were observed in RT-PCRs performed with or without primers for β-actin (results not shown). UGT expression in aerodigestive tract tissues. UGT mRNA was detected by duplex RT-PCR of pooled total RNA samples, as described under Materials and Methods, with aliquots electrophoresed in 8% polyacrylamide. Duplex RT-PCR was performed using specific exon 1-derived sense primers and a common exon 3-derived antisense primer for analysis of all family 1 UGTs. Specific exon 1-derived primers and a common exon 3-derived antisense primer was used for the analysis of UGT2B4 and UGT2B7, whereas specific exon 1-derived and a common exon 2-derived antisense primer was used for the analysis of UGT2B15 and UGT2B17. β-Actin was coamplified as a positive control for RT-PCR amplification, and negative controls without RNA (indicated by −RNA) were performed for all RT-PCR experiments. A, family 1A UGTs; B, family 2B UGTs. DNA marker band sizes are indicted on the left of all the panels; band sizes of UGT and β-actin RT-PCR products are indicated on the right of all the panels. FoM, floor of mouth; esoph, esophagus; +, denotes RT-PCR amplification of corresponding UGT-overexpressing cell lines. Of the family 2B UGTs (Fig. 2B), only UGT2B4 (tongue and floor of mouth) and UGT2B17 (tonsil and larynx) were detected in pooled RNA samples from human aerodigestive tract tissues by duplex RT-PCR. Although UGT2B15 and UGT2B7 were not detected in any of the aerodigestive tract tissues examined using pooled RNA samples (Fig.2B), 2 of 10 individual esophageal specimens examined in this study exhibited UGT2B17 expression; one esophageal specimen exhibited UGT2B15 expression (results not shown). As shown in previous studies (Beaulieu et al., 1997; Ullrich et al., 1997; King et al., 1999; Levesque et al., 1999), family 2B UGTs were well expressed in human liver. Other than UGT2B15 expression in a single lung specimen, none of the other family 2B UGTs were detected in human lung, whether by analysis of pooled or individual RNA samples. To compare the levels of tissue expression for UGTs that were expressed in multiple aerodigestive tract tissues, semiquantitative duplex RT-PCR was performed. As shown for UGT1A10 in larynx (Fig.3, A and B), linear increases in RT-PCR product were obtained by semiquantitative analysis, a pattern observed for all semiquantitative duplex RT-PCR analysis of UGT expression performed in this study. Using UGT/β-actin ratios as a measurement of the relative level of UGT expression, both UGT1A7 and UGT1A10 were shown to be relatively well expressed in all aerodigestive tract tissues examined (Fig. 3C). Although UGT1A6 was expressed at high levels in larynx (at levels similar to that observed for liver), low levels of expression were observed for other aerodigestive tract tissues, including esophagus. Similarly, the levels of expression of both UGTs 2B4 and 2B17 were significantly higher in liver than that observed for the UGT family 2B-expressing aerodigestive tract tissues. Semiquantitative duplex RT-PCR analysis of UGT expression in aerodigestive tract tissues. 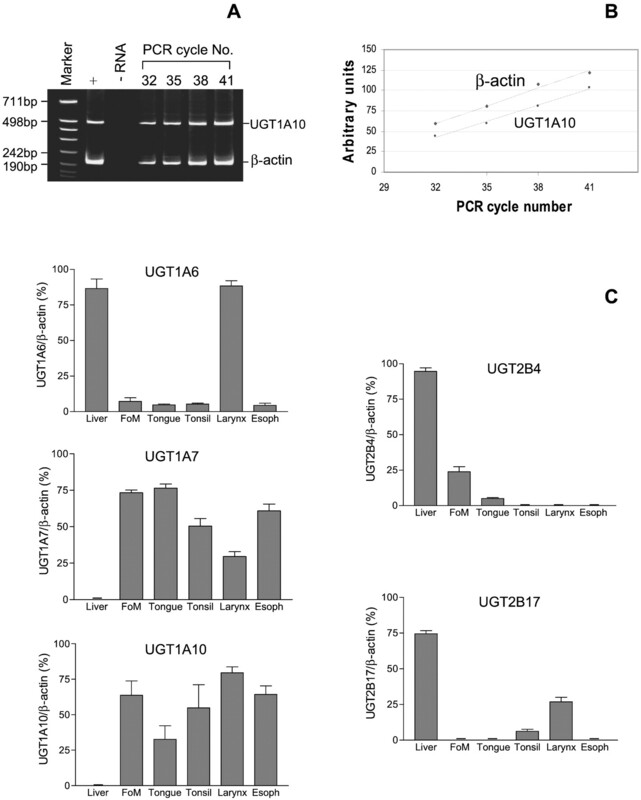 A, representative gel of duplex RT-PCR amplification of UGT1A10 using pooled laryngeal total RNA as template after 32, 35, 38, and 41 cycles of PCR (indicated at the top of the panel). DNA marker is indicated on the left of the panel. + indicates duplex RT-PCR amplification using an esophageal total RNA sample (3 μg) previously shown to express UGT1A10; −RNA indicates duplex RT-PCR amplification performed without RNA. Ten-microliter aliquots were loaded onto gel for each of the indicated cycle numbers. B, graph depicting densitometric readings of UGT1A10 and β-actin RT-PCR amplifications corresponding to panel A. C, UGT/β-actin densitometric ratios as a measurement of the relative expression of UGT1A6, UGT1A7, UGT1A10, UGT2B4, and UGT2B17 in human tissues (tissue type indicated at the bottom of each panel). FoM, floor of mouth; esoph, esophagus. Activities of Aerodigestive Tract-Expressing UGTs against 7-OH-BaP. Previous studies have implicated several UGTs in the glucuronidation of BaP metabolites (Jin et al., 1993a,b; Grove et al., 1997; Mojarrabi and Mackenzie, 1998; Strassburg et al., 1999; Guillemette et al., 2000). To better assess the relative activities of aerodigestive tract-expressing UGTs against BaP metabolites, we performed a comprehensive screening of aerodigestive tract-expressing UGT-overexpressing cell lines or baculosomes for BaP metabolite-glucuronidating activity using 7-OH-BaP as substrate. 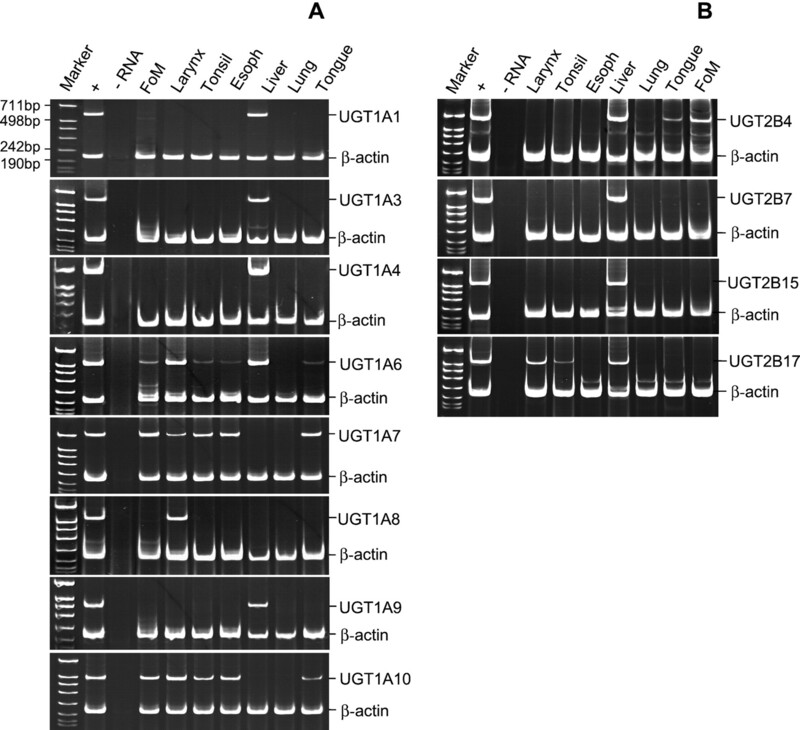 UGT1A7- and UGT1A10-overexpressing baculosomes, as well as UGT1A8-overexpressing cell homogenates, exhibited detectable levels of glucuronidating activity against 7-OH-BaP using as little as 0.1 mg of baculosome or cell homogenate protein in glucuronidation assays (Table 3). The relative affinity of each of these UGTs for 7-OH-BaP as determined by kinetic (Km) analysis was 1A10 > 1A7 > 1A8. No detectable activity against 7-OH-BaP was observed for UGTs 1A6, 2B4, or 2B17 using up to 5 mg of cell homogenate in glucuronidation assays; all were active against 1-naphthol (UGT1A6), clofibric acid (UGT2B4), or androsterone (UGT2B17) as test substrates (results not shown). Glucuronidation has been implicated as a major detoxification pathway for many carcinogens, including polycyclic aromatic hydrocarbons like BaP and other tobacco carcinogens like NNK (Richie et al., 1997; Strassburg et al., 1999; Ren et al., 2000). Although recent studies have suggested that many enzymes within the human UGT superfamily are extra-hepatic, however, previous studies examining UGT enzyme expression patterns have focused primarily on sites not known as primary targets for tobacco-induced carcinogenesis, including the digestive tract, the prostate, and the brain (Cheng et al., 1999; Hum et al., 1999; King et al., 1999; Strassburg et al., 2000; Tukey and Strassburg, 2000). In the present study, all of the aerodigestive tract tissues examined exhibited glucuronidating activity against multiple BaP metabolites. This is consistent with the fact that several UGTs were expressed in all aerodigestive tract tissues examined in this study. Previous studies have shown that several UGTs, including UGT2B7, UGT1A7, UGT1A8, UGT1A9, and UGT1A10, are active against several BaP phenols (Jin et al., 1993a,b; Grove et al., 1997; Mojarrabi and Mackenzie, 1998; Strassburg et al., 1999; Guillemette et al., 2000). Of these, UGT1A7 and UGT1A10 were well expressed in all aerodigestive tract tissues examined in the present study, whereas UGT1A8 was expressed in larynx. In addition, all three of these UGTs exhibited activity against 7-OH-BaP, with UGT1A10 exhibiting the highest affinity for 7-OH-BaP as determined by kinetic analysis. None of the other aerodigestive tract-expressing UGTs (UGT1A6, UGT2B4, and UGT2B17) exhibited activity against 7-OH-BaP. These data are consistent with results from preliminary studies in our laboratory suggesting that UGT1A7, UGT1A8, and UGT1A10 all exhibit significant activity againsttrans-BaP-7,8-dihydrodiol, a direct precursor of the highly carcinogenic BaP-7,8-diol-9,10-epoxide (Fang et al., 2002). Together, these data suggest that UGT1A7, UGT1A8, and particularly UGT1A10 play an important role in tobacco carcinogen detoxification in the aerodigestive tract. Differences were observed for aerodigestive tract tissues in their glucuronidating activity against different BaP metabolites in the present study. This may be due in part to differences in levels of expression of BaP metabolite-glucuronidating UGTs. For example, unlike that observed for microsomes from other aerodigestive tract tissues, laryngeal microsomes exhibited higher activity against 9-OH-BaP than 3-OH-BaP. This may be a result of the fact that in addition to UGT1A7 and UGT1A10, which were expressed in all aerodigestive tract tissues examined, UGT1A8 was also expressed in larynx. The detection of glucuronidating activity in aerodigestive tract tissues and that specific UGTs are expressed in these tissues are consistent with recent data demonstrating that such UGTs could play an important role in tobacco-related cancer risk. Zheng et al. (2001) has demonstrated that UGT1A7 allelic variants coding for variant UGT1A7 isoforms with decreased activity against BaP phenols significantly contribute to increased risk for orolaryngeal cancer, an association that was linked to smoking. Studies are currently underway examining whether such associations may also be present for other aerodigestive tract tissue-expressing, BaP phenol-metabolizing UGTs (i.e., UGT1A10 and UGT1A8). Preliminary studies have shown that there exist at least three independent amino acid-altering polymorphisms present in the coding region of the UGT1A10 gene (Z. Zheng and P. Lazarus, unpublished results). The presence of these polymorphisms may be particularly important in risk assessment studies of aerodigestive tract cancer risk given the activity of UGT1A10 toward BaP metabolites. The functional significance of these polymorphisms and their potential role in aerodigestive tract cancer risk is currently being assessed. The data presented in this study strongly suggest that glucuronidation is not a major metabolic pathway/detoxification mechanism in human lung. Similar to that observed in other studies of other substrates, including the NNK metabolite 4-(methylnitrosamino)-1-(3-pyridyl)-1-butanol and 4-nitrophenol (Ren et al., 2000), no glucuronidating activity was observed in microsomes from human lung specimens against any BaP metabolite tested. Analysis was performed using up to 1 mg of lung microsomal protein and was performed for three normal lung specimens from three individual subjects. These data are consistent with the fact that none of the UGTs screened in this study were expressed in lung tissue, as determined by duplex RT-PCR of pooled RNA samples. These data are consistent with previous studies of UGT expression in lung. Using duplex RT-PCR assays similar to that described in the present study, no expression of UGT1A9 and, at best, low levels of expression of UGT2B7 were detected by Ren et al. (2000), whereas King et al. (1999) showed that UGT1A6 and UGT2B7 were not expressed in lung. This is in contrast to that observed by Hum et al. (1999), who suggested that all family 2B UGT enzymes are expressed in human lung tissue. The reason for the disparity observed between this latter study and other studies remains unclear. In the present study, only UGT1A6, UGT1A7, and UGT1A10 were detected in RNA samples from esophageal tissues from individual subjects. This contrasts with previous results from Strassburg et al. (1999) who, in addition to UGT1A7 and UGT1A10, found that UGTs 1A8, 1A9, and 2B7 were also expressed in two human esophageal specimens and that UGT2B15 was detected in one of two specimens. In addition, contrary to that observed in the present study, no esophageal UGT1A6 expression was detected in previous studies (Strassburg et al., 1999). These discrepancies could be due to several potential factors, including site of specimen collection (i.e., upper versus lower esophagus), polymorphic expression of individual UGT enzymes, or effects on UGT inducibility by exogenous exposures. Previous studies have indicated that, based upon RT-PCR analysis, certain UGTs exhibit polymorphic expression (Strassburg et al., 1998a, 2000). Multiple UGTs were shown to exhibit differential expression in normal gastric (Strassburg et al., 1998a), duodenum, jejunum, ileum (Strassburg et al., 2000), and esophagus (Strassburg et al., 1999). Although UGT2B15 and UGT2B17 expression was not detected by analysis of pooled samples in the present study, expression of UGT2B17 was detected in esophageal tissue for 2 of 10 subjects when RNA samples were analyzed individually, whereas UGT2B15 was detected in one esophageal and one lung specimen. These data support results from previous studies suggesting that certain UGTs are either inducible or may exhibit polymorphic expression. In summary, the data presented in this study demonstrate that aerodigestive tract tissues exhibit significant glucuronidating activity against BaP metabolites and that UGT enzymes with activity against these metabolites are expressed in aerodigestive tract tissues. These results are consistent with recent studies suggesting that specific UGTs play an important role in the detoxification of tobacco carcinogens and in risk for aerodigestive tract cancer (Zheng et al., 2001). Further studies are currently being performed examining whether BaP metabolite-glucuronidating UGTs may play a similar role for other cancers of the digestive tract (i.e., colon) in which BaP exposure is also etiologically important. We are grateful of the Tissue Procurement Facility of the H. Lee Moffitt Cancer Center for access to tissue specimens and patient chart data. These studies were supported by Public Health Service (PHS) Grants DE12206 and DE13158 (National Institute of Dental and Craniofacial Research) to P. Lazarus and PHS Grant CA68384 (National Cancer Institute; P. Lazarus, project leader; Steven Stellman, principal investigator). (1998) Isolation and characterization of a human orphan UDP-glucuronosyltransferase, UGT2B11. Bochem Byophys Res Comm 248:44–50. (1997) Chromosomal localization, structure, and regulation of the UGT2B17 gene, encoding a C19 steroid-metabolizing enzyme. DNA Cell Biol 16:1143–1154. (1998) Characterization and regulation of UDP-glucuronosyltransferases in steroid target tissues. J Steroid Biochem Mol Biol 65:301–310. (2000) Isolation and characterization of the human UGT2B7 gene. Biochem Biophys Res Commun 272:616–621. (1998) Cloning and expression of human UDP-glucuronosyltransferase (UGT) 1A8. Arch Biochem Biophys 356:301–305. (1999) Studies on the substrate specificity of human intestinal UDP-glucuronosyltransferases 1A8 and 1A10. Drug Metab Dispos 27:1165–1170. (1987) Purification and properties of rat kidney UDP-glucuronosyltransferase. Biochem Pharmacol 36:245–251. (1993) Substrate specificities of two stably expressed human liver UDP-glucuronosyltransferases of the UGT1 gene family. Drug Metab Dispos 21:50–55. Fang J-L, Beland FA, Doerge DR, Wiener D, Guillemette C, Marques MM, and Lazarus P (2002) Characterization of benzo[a]pyrene-7,8-dihydrodiol glucuronidation by human liver microsomes and overexpressed human UDP-glucuronosyltransferase enzymes. Cancer Res, in press..
(1997) Identification of a rat oltipraz-inducible UDP-glucuronosyltransferase (UGT1A7) with activity towards benzo[a]pyrene-7,8-dihydrodiol. J Biol Chem 272:1621–1627. (1998) Glucuronidation: a dual control. Gen Pharmacol 31:683–688. (2000) Structural heterogeneity at the UDP-glucuronosyltransferase 1 locus: functional consequences of three novel missense mutations in the human UGT1A7 gene. Pharmacogenetics 10:629–644. (1992) In vitro and in vivo biotransformation and covalent binding of benzo[a]pyrene in Gunn and RHA rats with a genetic deficiency in bilirubin uridine diphosphate-glucuronosyltransferase. J Pharmacol Exp Ther 263:3343–3342. (1994) Modulation of benzo[a]pyrene bioactivation by glucuronidation in lymphocytes and hepatic microsomes from rats with a hereditary deficiency in bilirubin UDP-glucuronosyltransferase. Toxicol Appl Pharmacol 127:306–313. (1993a) The glucuronidation of hydroxylated metabolites of benzo[a]pyrene and 2-acetylaminofluorene by cDNA-expressed human UDP-glucuronosyltransferases. Carcinogenesis 14:2637–2639. (1993b) cDNA cloning and expression of two new members of the human liver UDP-glucuronosyltransferase 2B subfamily. Biochem Biophys Res Commun 194:496–503. (1997) Isolation and characterization of UGT2B15(Y85): a UDP-glucuronosyltransferase encoded by a polymorphic gene. Pharmacogenetics 7:317–325. (1999) Characterization and substrate specificity of UGT2B4 (E458): a UDP-glucuronosyltransferase encoded by a polymorphic gene. Pharmacogenetics 9:207–216. (1998) Characterization of two UDP glucuronosyltransferases that are predominantly expressed in human colon. Biochem Biophys Res Commun 247:704–709. (1978) Glucuronidation of benzo[a]pyrene in hamster embryo cells. Chem Biol Interact 22:1–14. (1979) Mutagenesis of certain benzo[a]pyrene phenols in vitro following further metabolism by mouse liver. Biochem Pharmacol 28:1615–1622. (1995) Gene structure at the human UGT1 locus creates diversity in isozyme structure, substrate specificity, and regulation. Prog Nucleic Acid Res Mol Biol 51:305–338. (1999) Glucuronidation of the lung carcinogen 4-(methylnitrosamino)-1-(3-pyridyl)-1-butanol (NNAL) by rat UDP-glucuronosyltransferase 2B1. Drug Metab Dispos 27:1010–1016. (2000) O-Glucuronidation of the lung carcinogen 4-(methylnitrosamino)-1-(3-pyridyl)-1-butanol (NNAL) by human UDP-glucuronosyltransferases 2B7 and 1A9. Drug Metab Dispos 28:1352–1360. (2000) Polymorphic gene regulation and interindividual variation of UDP-glucuronosyltransferase activity in human small intestine. J Biol Chem 275:36164–36171. (1998a) Expression of the UDP-glucuronosyltransferase 1A locus in human colon. Identification and characterization of the novel extrahepatic UGT1A8. J Biol Chem 273:8719–8726. (1998b) Polymorphic expression of the UDP-glucuronosyltransferase UGT1A gene locus in human gastric epithelium. Mol Pharmacol 54:647–654. (1999) Regulation and function of family 1 and family 2 UDP-glucuronosyltransferase genes (UGT1A, UGT2B) in human oesophagus. Biochem J 338:489–498. (2000) Human UDP-glucuronosyltransferases metabolism, expression, and disease. Annu Rev Pharmacol Toxicol 40:581–616. (1997) Drug-metabolizing enzymes in pharyngeal mucosa and in oropharyngeal cancer tissue. Biochem Pharmacol 54:1159–1162. (1995) Potential genoprotective role for UDP-glucuronosyltransferases in chemical carcinogenesis: initiation of micronuclei by benzo[a]pyrene and benzo[e]pyrene in UDP-glucuronosyltransferase-deficient cultured rat skin fibroblasts. Cancer Res 55:1045–1051. (2001) Tobacco carcinogen-detoxifying enzyme UGT1A7 and its association with orolaryngeal cancer risk. J Natl Cancer Inst 93:39–46.